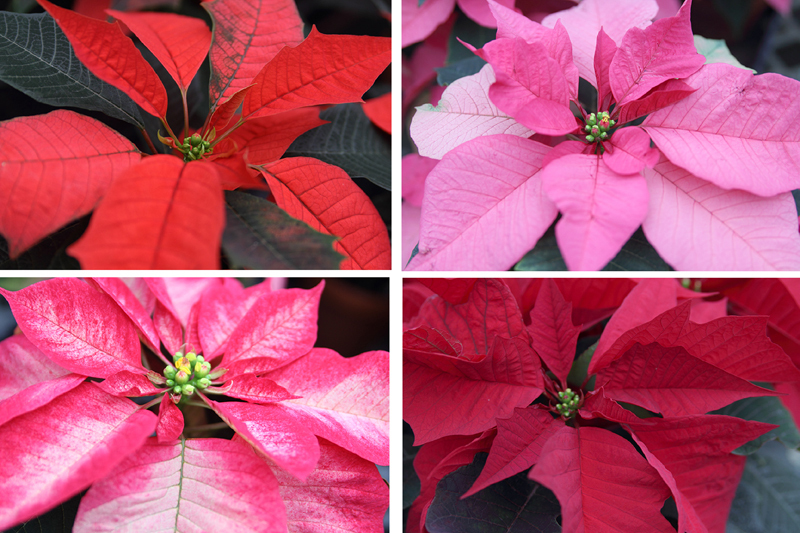 Don’t tell our poinsettias, but they’re a little high-maintenance. Which makes our growers a bit fussy—don’t tell them either, we don’t want to hurt their feelings…we really need them. 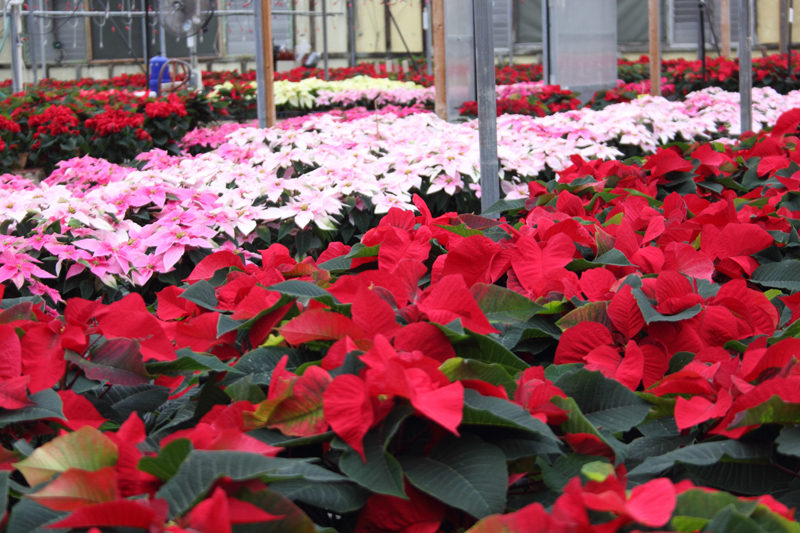 Especially since they’re the very best at growing poinsettias locally, right here in our very own greenhouses. 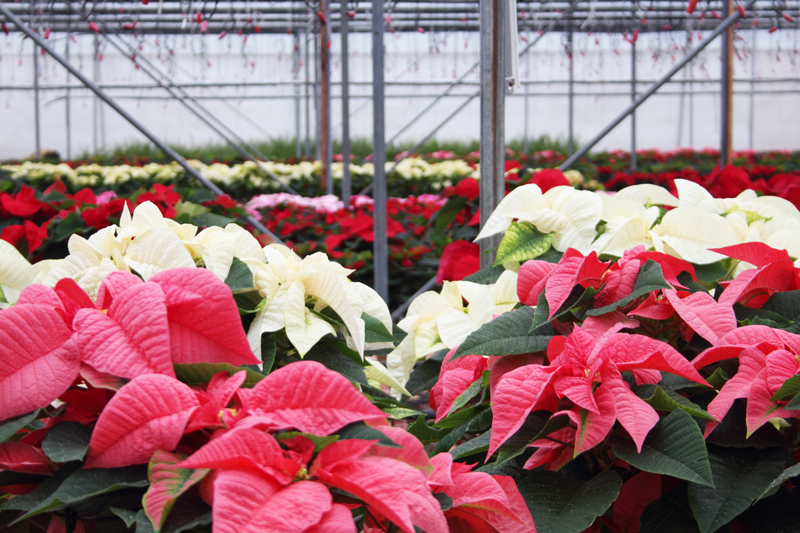 And when you find out what all goes into growing beautiful poinsettias, you won’t blame our growers for being fussy either. Here’s what goes into making it happen, along with beautiful photos of their blooms, because that’s what makes it all worth it after all. 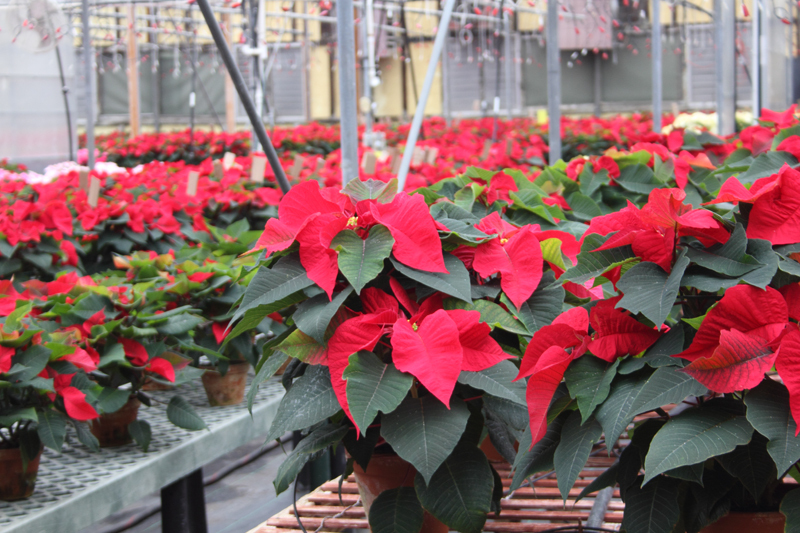 It all starts back in mid-July (yes, poinsettias in summer!) 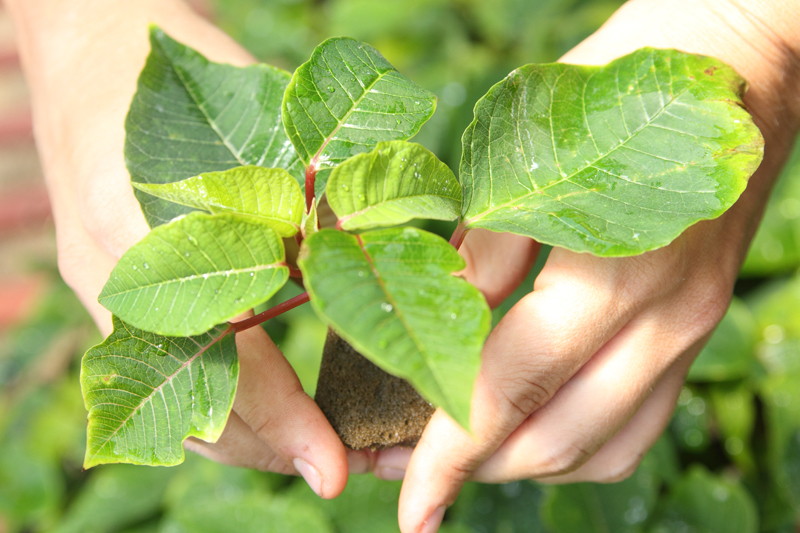 when we first receive tons of tiny little poinsettia plugs. 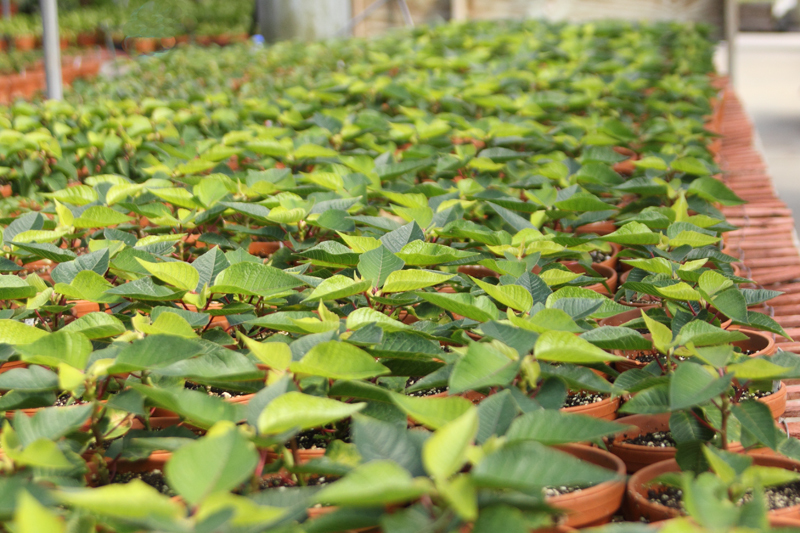 Each and everyone have to be hand-planted into their new pots, and keeping them happy from there isn’t easy. They must be kept at just the right temperature, not dropping below 65 degrees at night and remaining at about 75-78 degrees during the day. Or else they get awful cranky. And you won’t like them when they’re angry. Around the end of September, they then require a strict dark treatment, where our greenhouses are shaded to ensure 12 hours of darkness, simulating the shorter days of the tropical environment they love. Wouldn’t we all love 12 hours of uninterrupted rest? We’d all be a little perkier, too. Not to mention everything in between; hand-pinching to ensure they first grow low and full instead of tall and leggy; perfect spacing so each pots growing leaves keep to themselves; and staking the big ones who need extra support until they are strong enough to grow tall on their own. Plus, giving them just the right amount of water, of course. Whew, that’s a lot of work. But it’s all worth it when you see how gorgeous they become. So next time you see once of our wonderful, patient, at times fussy growers…give them a pat on the back. They really deserve it.